Acrylic sandwich boards are extremely elegant display frames. Off late, there are being used pretty extensively, in modern retail stores. 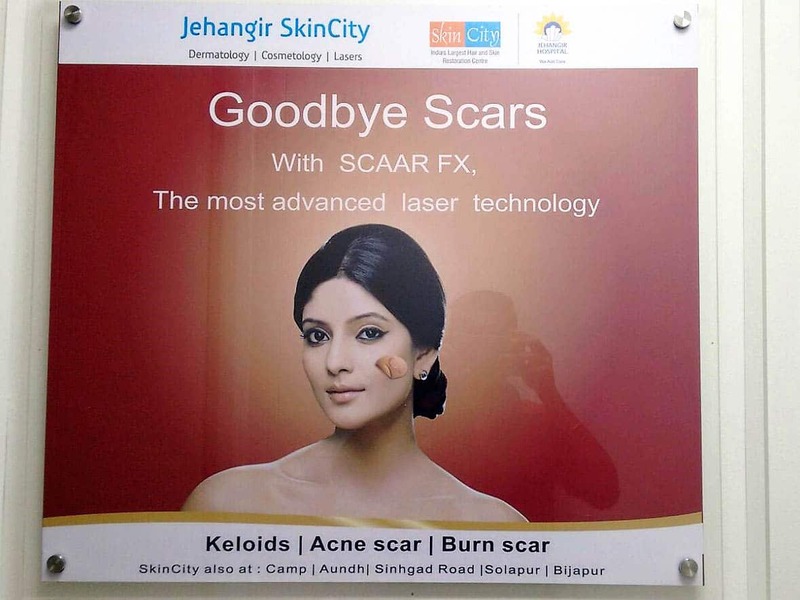 Acrylic sandwich panels have a USP wherein, the image within can be easily replaced even by anybody in the store. 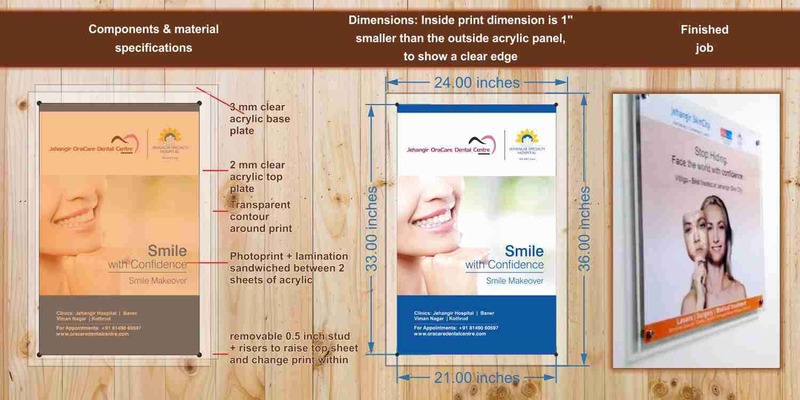 After the initial cost of the frame, the cost of the print within is negligible and the same can be repeatedly changed. Supermarkets or stores in malls, continually need to update their visual communication. This new communication could be about new product launches, changes in the prices or simply new product photography. For example, an acrylic frame can showcase a ‘Ganpati’ discount scheme. And then, the same frame might have to be used to show a Diwali sale ad in a few months. One way to do this, is to paste vinyls or sunboards. But to do this, the store manager will have to call in a fitter every time s/he needs to change the print. So, acrylic frames which allow for the easy changing of the prints within, are a solution to this problem. As the name suggests, the sandwich acrylic display frame is made of two sheets of clear acrylic. Acrylic sheets are as clear as glass but extremely light weight and easy to handle. Coming back to our display panel, we use a 3 / 5 mm thick base sheet. The photo print is mounted on the base sheet. It is then covered with a 2 / 3 mm thick top sheet. The top sheet is what gives the acrylic sandwich boards their typical shiny finish. The entire frame rests on the base plate. 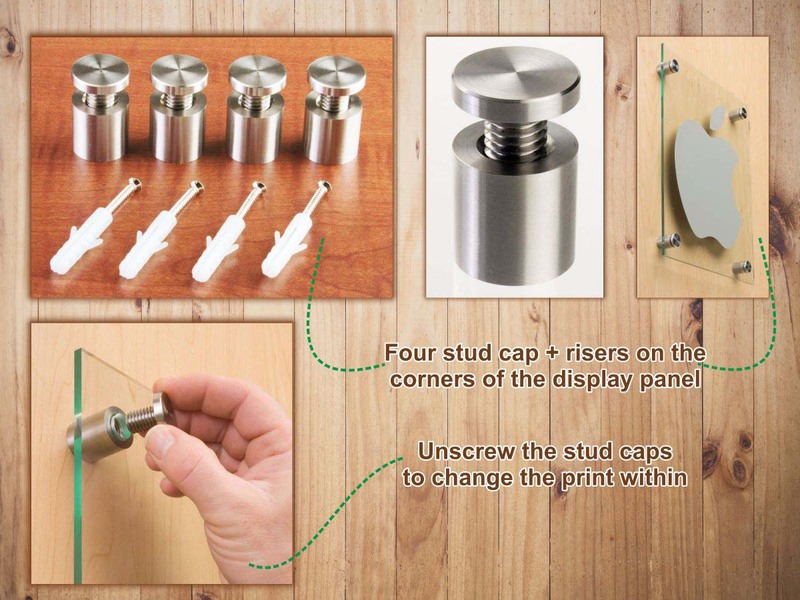 We provide for open able stud caps on four corners of the frame. We also include ‘risers’ beneath the studs which increase the distance between the wall and the panel. 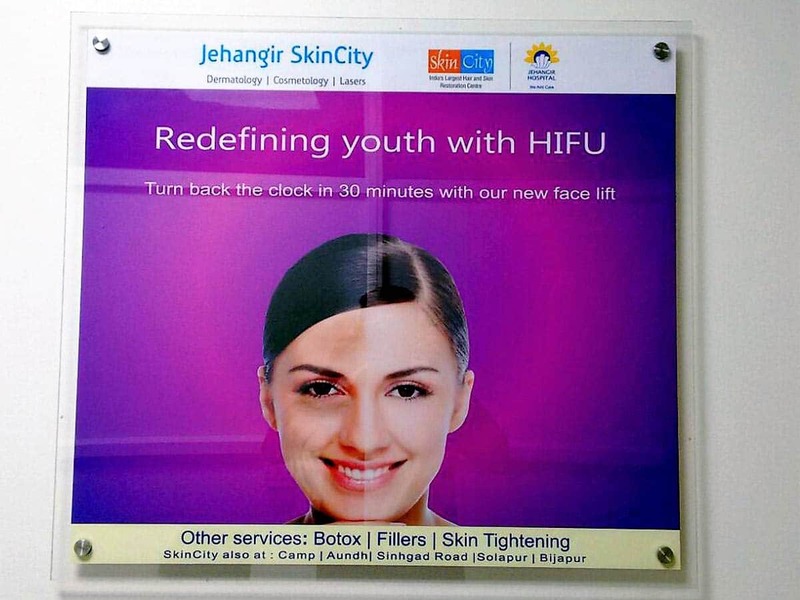 Once installed, the acrylic frame gives a beautiful 3D effect. Option A: The display panel is made of a base and top sheet of clear acrylic. The print is sandwiched between these 2 sheets. Option B: In this configuration, we do away with the base panel and substitute it with a 3 or 5 mm thick sheet of sunboard. With one one less sheet of acrylic, the price comes down. If your communication needs to be repeatedly changed, you should probably go for the first option above. This is because, in the second sunboard configured display panel, changing the print for the end user is slightly more difficult. But there may be a situation where the communication within the display panel has a longer life. For example, you may want to show case your company’s mission statement or product photos. In this case we recommend that you opt for the second more economical choice shown above. As you can see from the images above, the store employee simply needs to unscrew the stud caps on the corners of the sandwich acrylic frame. The top sheet comes off and the print within can now be easily replaced. The whole process of removing the top sheet, changing the print and putting back the top sheet, can be carried out in less than five minutes. 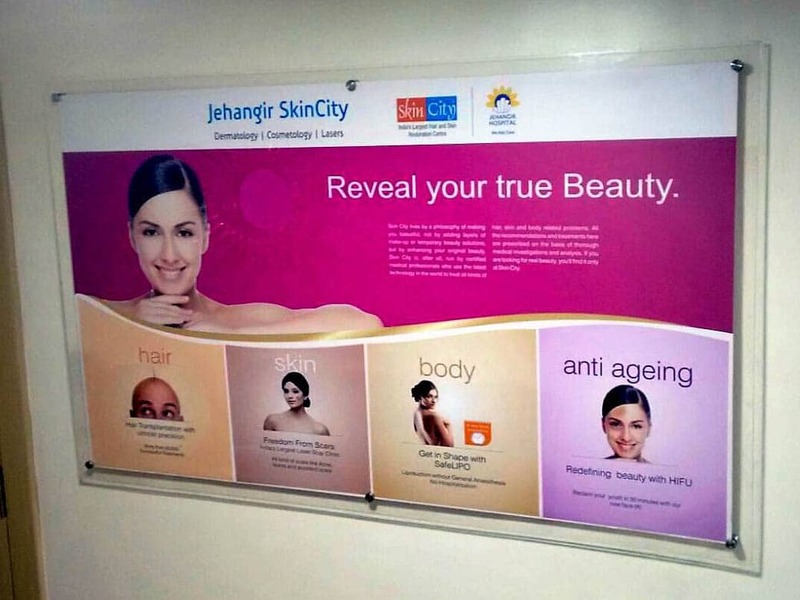 Shown above are installations of sandwich acrylic frames done at a Jehangir Skincity Clinic and the office of Girivan Resorts. The sheets are cut on our laser our CNC router machine. This gives the acrylic a very smooth and even finish. The frames typically have a ‘crystal edge’ which looks very good, when viewed from the side. The frame has four 10 mm holes on the corners. One inch risers are fitted beneath these holes. The risers are hollow and you can screw in a cap screw or stud in it. The two sheets of acrylic are held between the riser and stud cap. Great work by the artists .